I have read the text for Crumb a million times but, as is often the case, I have missed a few things. Here are the corrections. So sorry – Richard. As stated in our Terms and Conditions, we are not able to offer refunds or late notice amendments to classes where customers are unable to reach us due to adverse weather conditions. However, where we take the decision to cancel a class then we will move customers to a new date of their choice. Where classes are running, you should take your own decisions as to whether it is safe to travel to us in Bath. We do not encourage anyone to take any risks. If you are unable to attend a class please let us know as soon as you can. In the event that you are unable to reach us you may send someone else in your place but again please let us know. We understand that, where adverse weather conditions are concerned, it is not your fault that you are not able to reach us. Please understand that it is also not our fault. 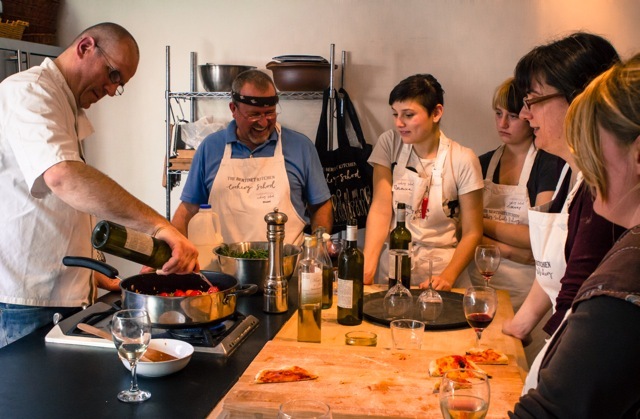 We have to go ahead and run our classes where the chef is able to make it in and where it is likely that at least some of the customers booked on the class are able to make it to the kitchen. As a goodwill gesture we will circulate (by email) a list of places available at short notice to those who have not been able to attend a class. Emails will be sent out roughly fortnightly. It is unlikely that we will be able to offer the same class on the same day of the week but we hope that customers will be able to find a class and date that suits them. The classes offered in this way will be available on a first come first served basis to all those in the same position. Customers will be able to choose a replacement class of the same or a lesser value than their original class. No refund or credit will be offered where the replacement class is of a lower value than the original class. Customers wishing to book onto a more expensive class will be asked to top up the difference. The cookery school will be closed for Christmas between 5pm on Friday 21st December and 9.30am on Monday 7 January. During this time we will not generally be able to respond to emails or telephone messages however we will be in touch with all customers who have left a message as soon as we return in the new year. If you have been given a voucher for a class in January but are not able to make the date please do leave us a message at the earliest opportunity. Thinking of running a summer workshop, a team building event or just treating your staff to something fun and enjoyable? 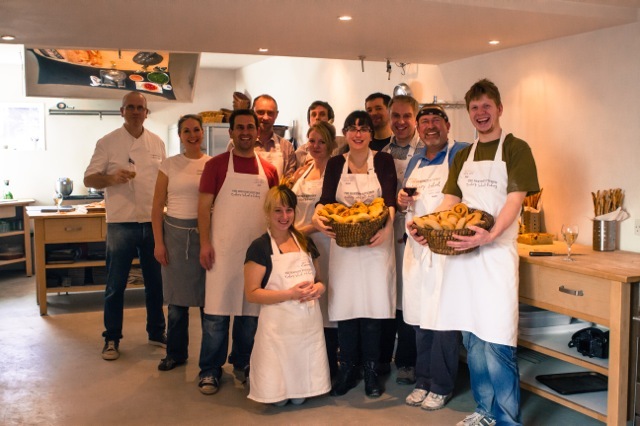 The Bertinet Kitchen can provide you with a bespoke cookery workshop to suit your needs. The event can be tailored to suit your requirements and can be as challenging as you like. You can even sit down for a rewarding lunch with wine when you’re done and sample everything you have made. Contact us on 01225 445531 to have a chat about all the exiciting options available. Don’t worry if your slab simply cracks – this often happens – indeed many of the pieces of stone I have in my ovens have cracks in them. It will not make any difference to your bread. If you have had any problems with baking stones do let us know. 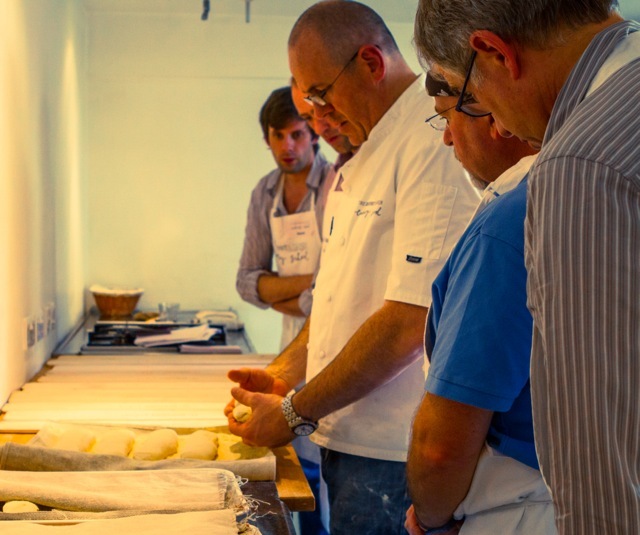 Our 5 day breadmaking course is our flagship or Rolls Royce class. It is the one that entices you from all corners of the globe and, though we say it ourselves, it really is a fantastic week. With thanks to chrisdaviesphotography.com (for most of the shots taken while he was with us on the class), here is a look at the full five days and what some of you have had to say about it…..
Day 1 is a vital part of the course where Richard makes sure that you have got the basic techniques on board. Whether you are new to bread making, new to his techniques or even if you have been working from the books for some time there is plenty to learn. Lots of individual attention but all of it good fun! By the end of the day you will have created fougasse (and flashed your first fougasse grin!) bread sticks, foccaccia, tin loaves and prepared a flamiche for lunch. Day 2 has a distinctly French feel. 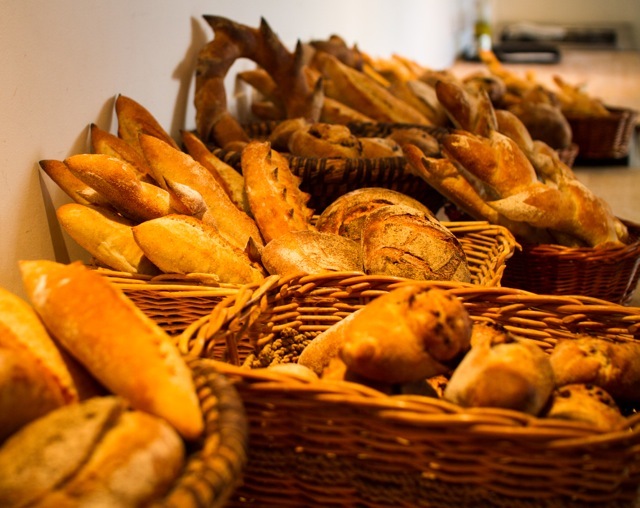 You will learn how to make a classic baguette, epis and pain de campagne. But more importantly you will start to learn about some of the key themes that run through the week. The first is working with ferments as we look at how using a poolish can develop the flavour of your bread. 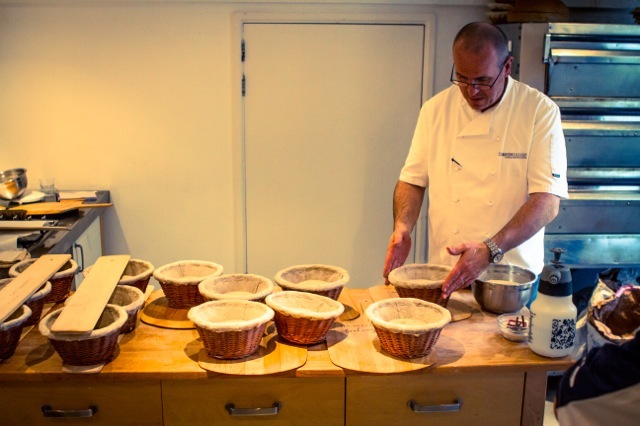 Then there is dividing and the key skill of moulding which takes practice, practice and more practice and is something Richard regularly reinforces with our own team of bakers. You will also start to learn how to use a lame correctly and how to bake with steam. Day 3 develops both the idea of working with a ferment (though as today has an Italian theme, it is a biga, for the ciabatta) and the moulding work. 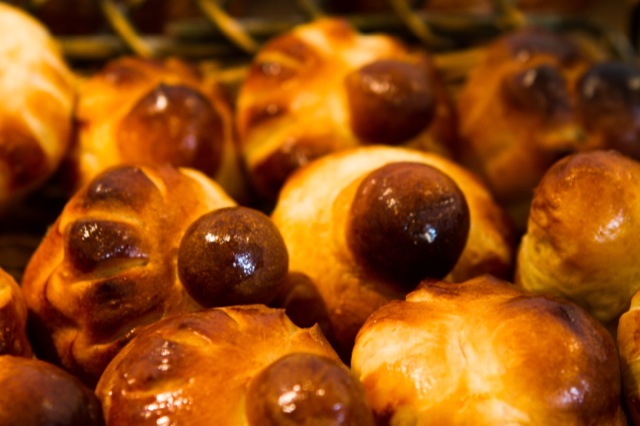 We also cover filled breads and look a little closer at working with inclusions. 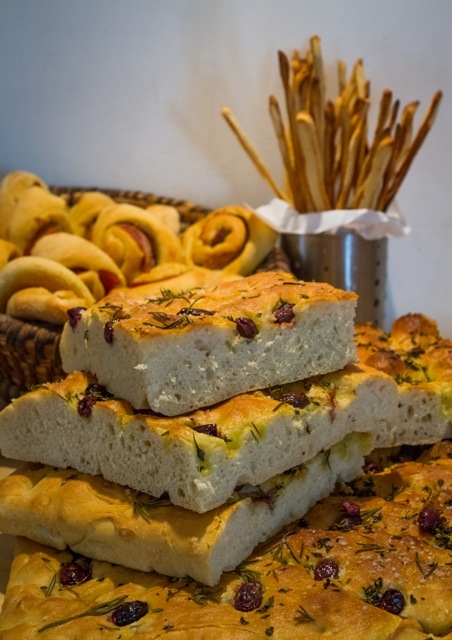 By the end of the day you will have created piles of beautiful authentic ciabatta, roasted tomato and pesto bread, bread swirls with parma ham and pine nuts, grissini and more. On day 4 we start the work we will complete on day 5 and take the first steps towards our sourdough. But we also spend day 4 looking at the differences in working with darker flours and the process of enriching doughs with butter, sugar and milk to create sweet doughs. 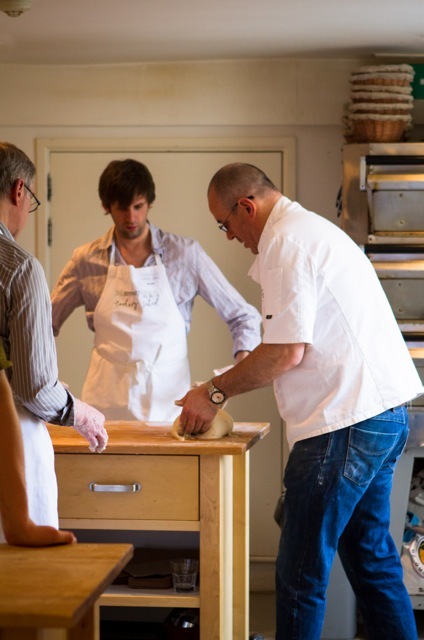 You will learn how to handle wholemeal and spelt doughs, how to make brioche, baguette viennoise, fruited tea loaves and even doughnuts. Day 5 is all about sourdough. There is a bit of theory but also a lot of practical work covering white sourdough, rye sourdough and wholemeal sourdough. 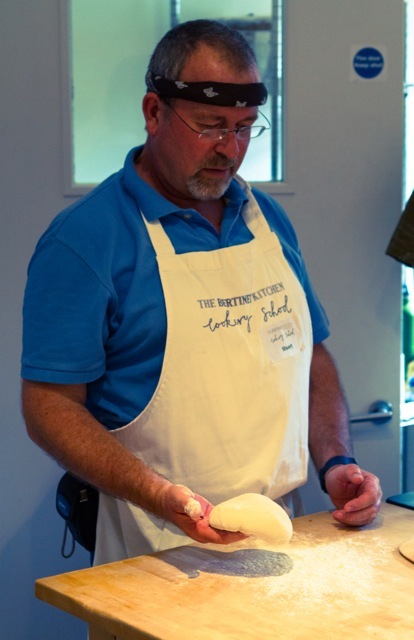 You will be perfecting moulding techniques, turning out beautiful loaves from your proving baskets and practising loading them into an oven to bake with steam and produce a fantastic crust. At the end of each day, the class gathers to make lunch. 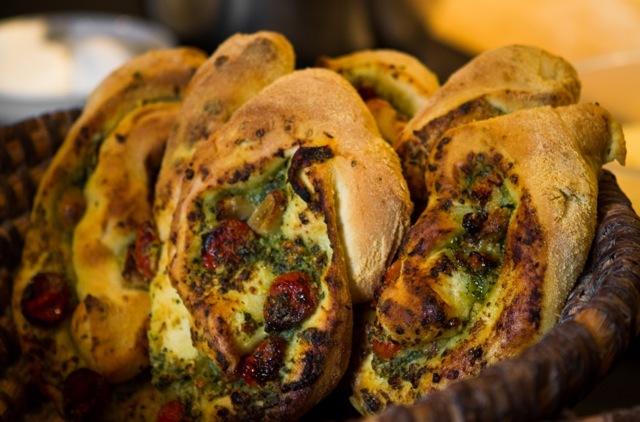 Something different everyday but always something to complement the bread you have been working on…. 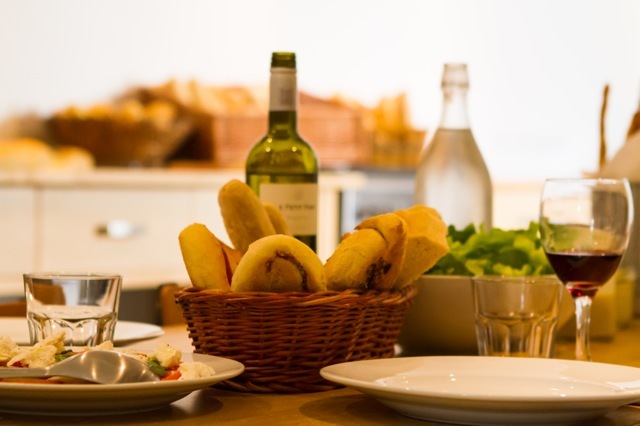 …flamiche with some left over white doughs, hanger steak to stuff in a freshly baked baguette, pizza of course on the Italian breads day plus some smoked salmon, rocket and roasted cherry tomato pasta, tartiflette or perhaps some soups for dunking. It’s time for a well earned glass of wine and a chance to digest what you have learned that day with your fellow bakers. 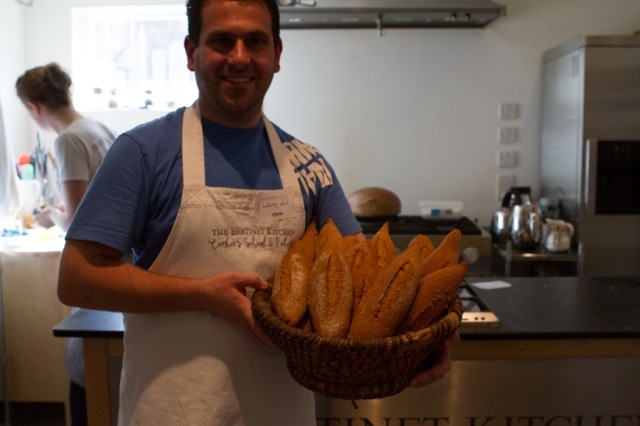 Richard is on hand to answer any queries you might have and to chat about bread and baking in all its aspects. 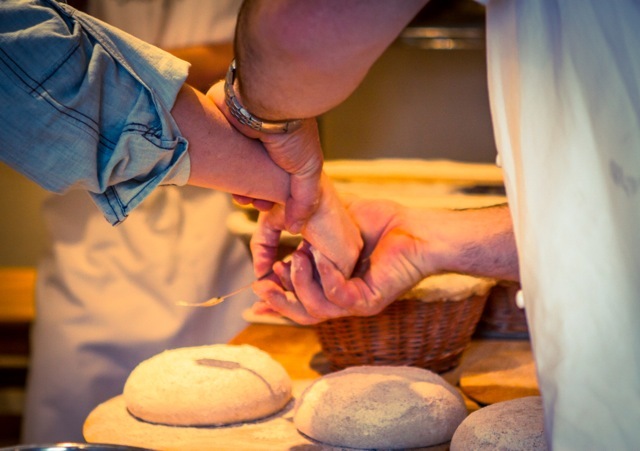 This is an example of the lovely unsolicited feedback we have for the 5 day bread course…..
“I just wanted to write to you to say how much I enjoyed the bread making course last week. 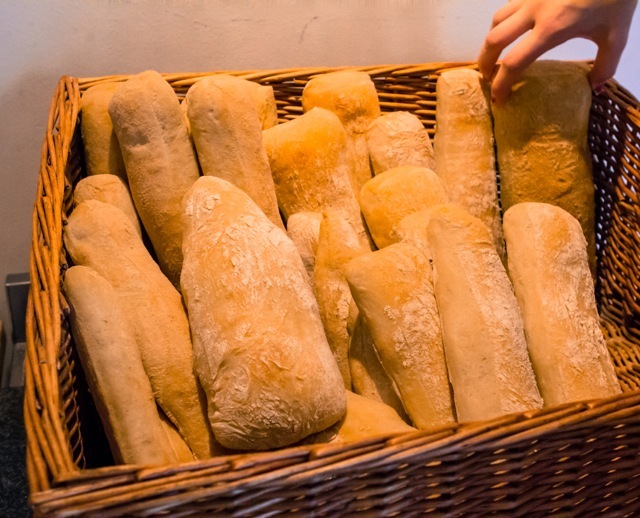 It really was a most relaxing, inspiring and rewarding experience, and it has certainly changed my view of bread. I will never buy or eat sliced bread again, and I very much hope that I will not be tempted to spend money on other people’s speciality bread either! 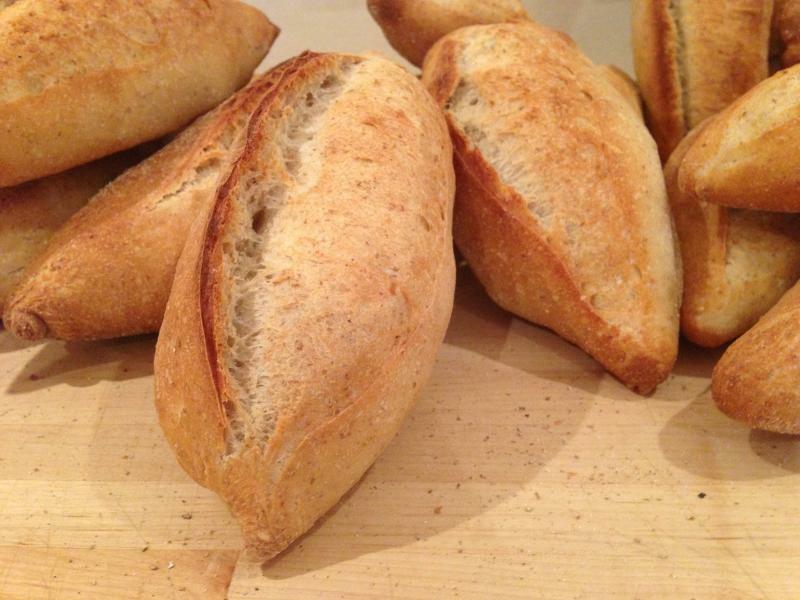 I have made a few baguettes over the last few days, and rather surprised everyone with the results. Everything you said to us last week makes perfect sense – and the results are very rewarding. I am so glad that I stayed for the whole course. Everything seemed to make much more sense by Friday, as you wisely predicted, and I found the chat at the end of the course really useful…. Finally, I thought that the course was extremely well designed and put together, and it would be difficult for me to suggest any changes or improvements. Breakfast, coffee & prunes, and a delicious lunch were a real treat, and I can only guess how much work you and your team had put in behind the scenes. The logic and content of the programme was perfect in my view. Jess gave me a piece of your ferment on Friday, and it has already been pressed into service, and refreshed! 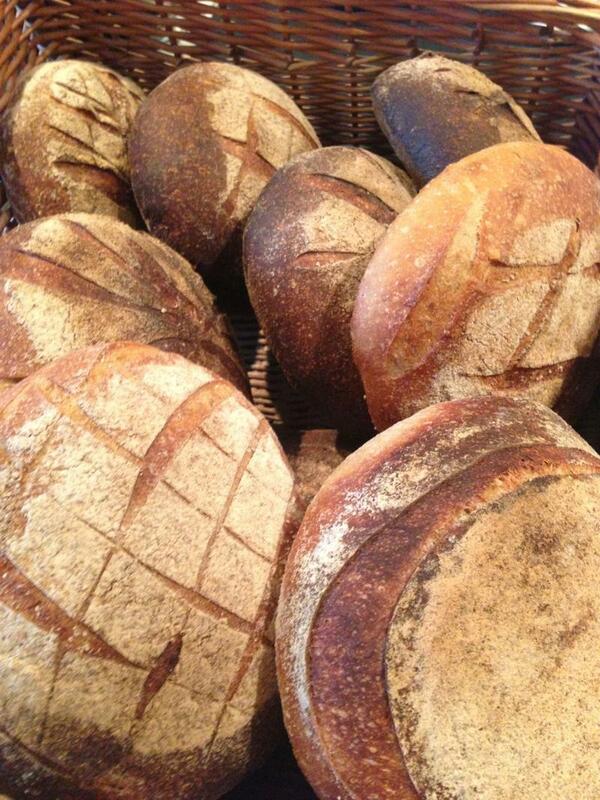 Our 5 day bread course runs 5 or 6 times a year. The price includes lunch with wine every day, all materials and ingredients, a recipe pack and folder, a signed copy of Richard Bertinet’s CRUST, a dough scraper, and a lame and blades. Founding Member of the I.C.S.A. 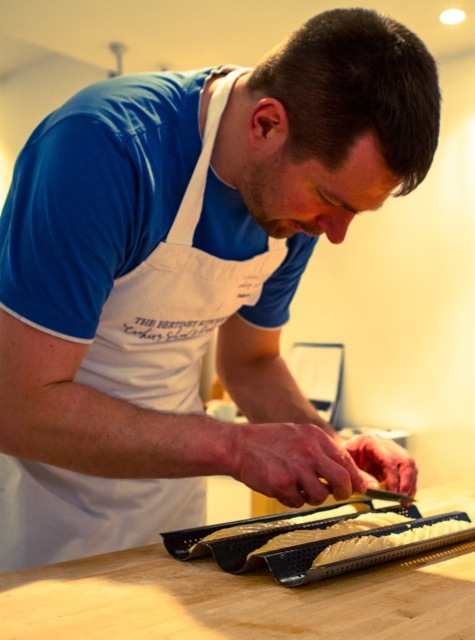 The Bertinet Kitchen is very proud to be a founding member of the Independent Cookery Schools Association (ICSA). 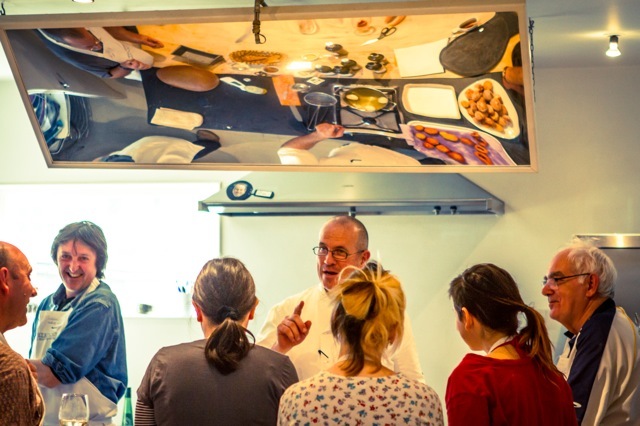 In the autumn of 2014 some of the most outstanding cookery schools in the Uk, including the Bertinet Kitchen, came together to form the ICSA. 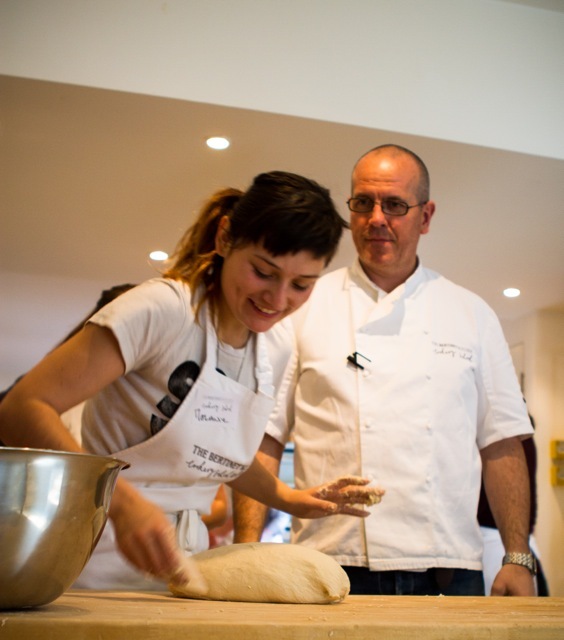 The ICSA is the only independent, non-profit, regulatory body for cookery schools in the UK. The mission of the ICSA is to assess, promote and advise cookery schools of excellence and help and encourage students in choosing quality schools in the ICSA group. Our members are assessed and accredited to the highest standard so you can be confident that you are receiving the best teaching in a professional environment. An ICSA school is a GREAT school. 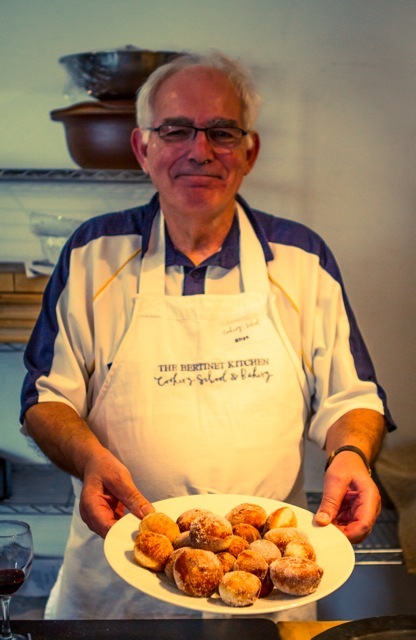 https://www.thebertinetkitchen.com/wp-content/uploads/2018/06/web.png 0 0 Jo Bertinet https://www.thebertinetkitchen.com/wp-content/uploads/2018/06/web.png Jo Bertinet2016-05-24 10:48:152018-05-24 10:49:03Founding Member of the I.C.S.A. We are absolutely thrilled to be able to tell you that yesterday Richard was names as the 2010 BBC Food Champion of the Year. Richard was nominated by listeners of Radio 4’s Food Programme who were asked to pick an individual who had inspired them to think differently about food and who had used their work in the past twelve months to give fresh insights into the food we eat, bringing about a wider passion for good food, demystifying great cooking or the food world in general. The BBC Radio Food & Farming Awards 2010, now in their eleventh year, are chosen by a panel of 12 experts (http://www.bbc.co.uk/radio4/features/ffa/2010/judges/) consisting of high-profile chefs, restaurateurs, food writers and nutritionists, including Angela Hartnett (Chair of Judges), Mark Hix, Charles Campion, Sheila Dillon, Rose Prince, Simon Parkes and Kath Dalmeny. As Food Champion of the Year, Richard was presented with his award at the BBC Radio Food & Farming Awards 2010 at the BBC Good Food show on Wednesday 24th November in Birmingham. The awards ceremony was hosted by Sheila Dillon of Radio 4’s The Food Programme.